Friarage Bridge, or Bridge No.100, is one of only two turnover bridges on the main channel of the Lancaster Canal. 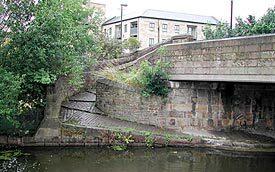 Now rebuilt, the original 1797 bridge was designed by John Rennie, the canal's engineer. A turnover bridge allows the towpath to cross the canal, that is, change sides. Only two are needed on this canal as the towpath follows the western bank for the whole of its length, apart from a short stretch at the Lancaster Basin. The other turnover bridge is Basin Bridge No.98. Friarage Bridge was originally a stone arch. It spanned slightly over 7m and provided headroom above the water of 3.45m. It allowed for a waterway width of 5.1m. Lancaster City Council strengthened the bridge at some point: the exact date is uncertain but it was possibly during the 1930s. At the same time they widened it by adding a 'horse' span constructed in steel. This new work spanned 25mm less than the stone arch and measured 2.06m wide internally. The steel beams were 1.22m deep with 46mm wide flanges. However, in recent years, the entire structure has been rebuilt using prestressed concrete beams with stone facings, so the present bridge bears little resemblance to Rennie's original.